Very hectic morning. But here, finally, is my Monday BIG CARD. While tidying up a bit I came across a sea sponge – pristine, never used. I thought Why not? 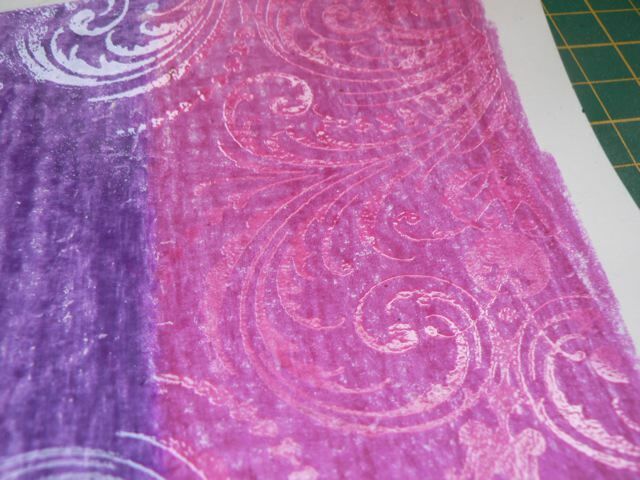 So I grabbed a couple of bright colours and my black cardstock, dampened my sponge and began pouncing, lightly, turning the sponge every so often so as not to get too regular a pattern. Liked that but it needed some punch. They acrylic paint goes a bit matte when it dries. 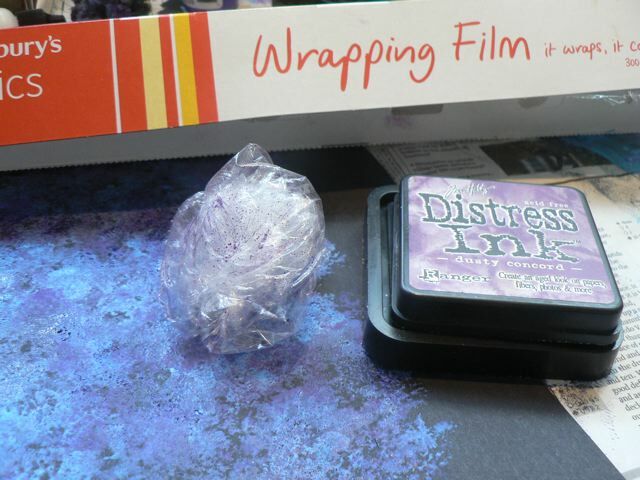 I grabbed the roll of cling film I used to lay over the one I did a week or so ago and wadded it up a bit then used it to apply some Distress ink over the paint. You can’t really see it very well, but a loosely gathered wodge of cling film gives a really cool impression – you really want the edges and not just a flat tight smooth surface. I rolled on some black paint to my home-made spotty stamp and stamped some of them, then I took a fresh (but old and unused) alphabet stamp sheet and peeled off a few of the letters. 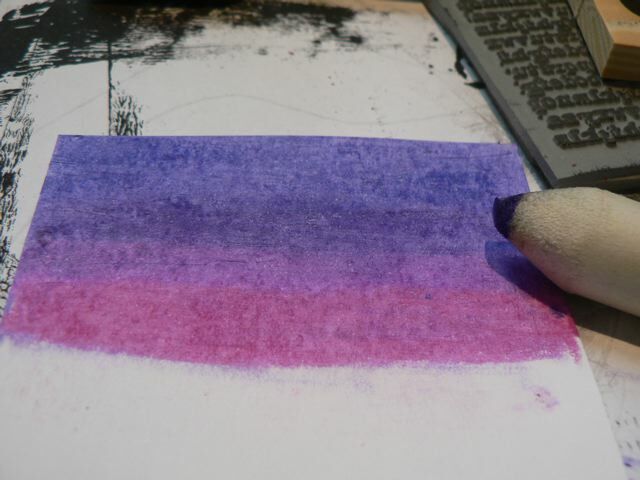 I rolled on some paint and used that as a stamp, applying it a bit randomly and not pressing down fully. Then I got up RIGHT AWAY and washed it off. Love the effect. I have a few sheets of small stamps that I have bought (usually very cheaply) and never used as they are a pain to stamp with. I have the little wood mounted sticks and I use them all the time. I’m pleased to have found a great way to use these finally. 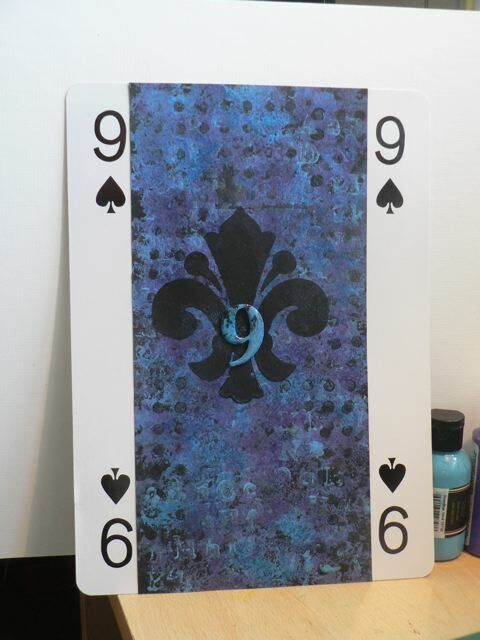 I added a black foam stamp and the number 9 (which I painted and coated with Glossy Accents) and am calling it done! I just cannot capture the depth this one has. 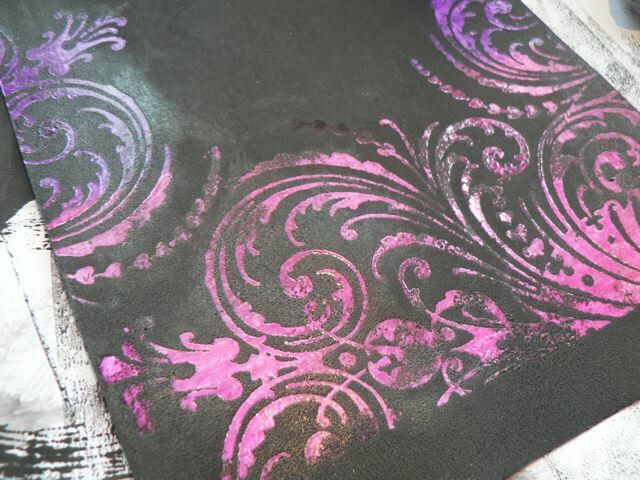 The sponged paint gives it a texture, and the sponged on DI is subtle but brighter over the paint. 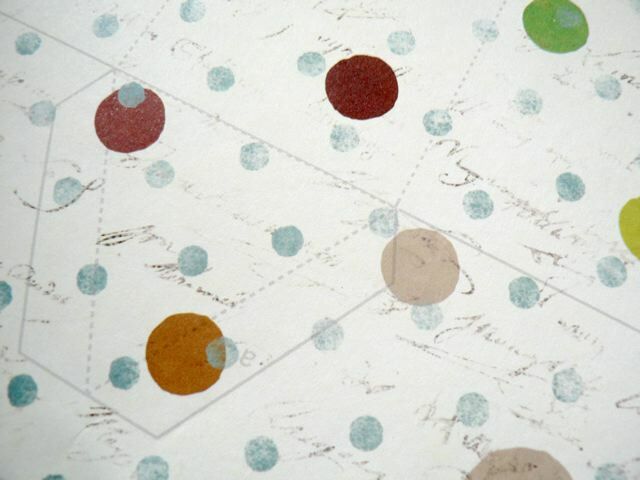 The letters are rimmed where the paint squigged up and some of the dots deposited colour where some look almost shadow like. I really must try to clean a bit. I can’t see me getting anything nice done with all the ink and paint, despite the newspaper! Important note! 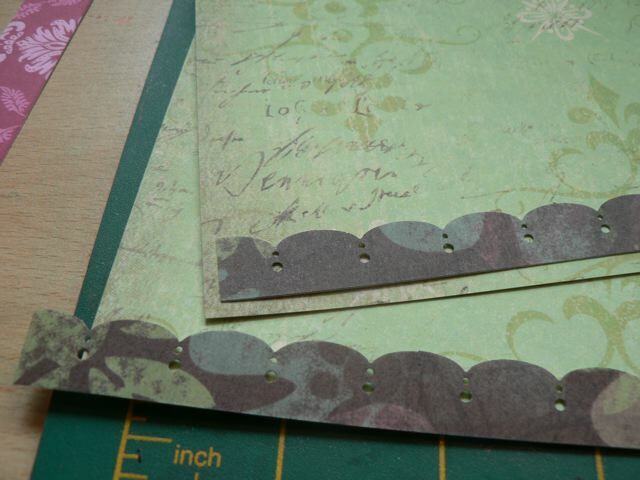 One user commented the scoring marks on the templates were too close together for the card she used. Ruth re-did the plain template and will re-do the Oval one. They are now in Dropbox, here. Download the ones with MORESPACE in the name for the improved versions! If you plan to print and hand score/cut then the originals are fine, no need to grab the improved ones. As promised I am adding the single page templates. The smaller one (Romantic version)is without the a and the bigger one (Get Well version)has it in place as it won’t be seen after assembly. I also have been sent an SVG by the lovely Ruth. She created it in MTC and sent a MTC file format too! I can’t append any of those formats here but I can add it to Dropbox, where you should be able to download it. One of the SVGs has the oval in place, the other is plain, for you to use whatever you like to create the aperture. click the links to see the download files. Thank you Ruth! I have not tested them, as I only have the baby Cricut and they are too large. but PLEASE LMK if there is any problems with them. Categories: digital goodies, downloads | Tags: templates | Permalink. Added the single page templates. Yep. That’s what I decided to call it. A Carousel Card! Now one thing first. I will be adding the two templates as two different PDFs. Two reasons: first, I am worried people might try to use them together, and second, the way the smaller card works, with the fluted back, means that if you don’t cover the inside of the flap, the a will be seen as printed. Not a huge big deal, perhaps, but I want to correct it. Who remembers “jungle bells?” LOL! OK, let me jump right in to the assembly of the final card. Now, this is just one way to do it – there are perhaps 10 other ways that might look equally nice. I’m sure you will discover them – and when you do, comment with a link because I want to see it. 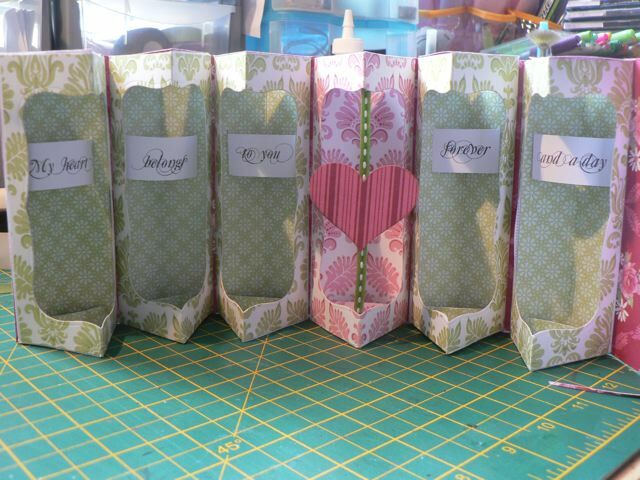 We will begin from the point where you have made your six boxes from the template (and we are using page ONE of the PDF) and decorated them as you like. I’ll just share my inserts with you. Mine is made from the template printed on the lighter side of double-sided cardstock. 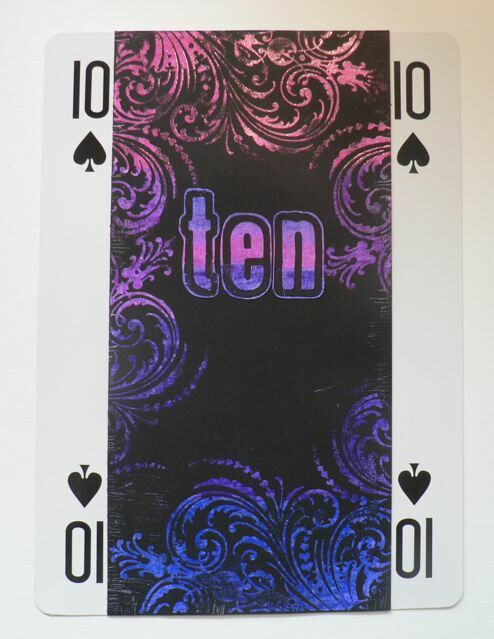 This is by far the easiest way to make one of these cards, with Template ONE printed on six sheets of double-sided card, on the side with the palest pattern so you can see the lines. The aperture is an oval. I thought it would look nice to mimic the oval aperture with oval embellishments. I printed the text on strips of card. 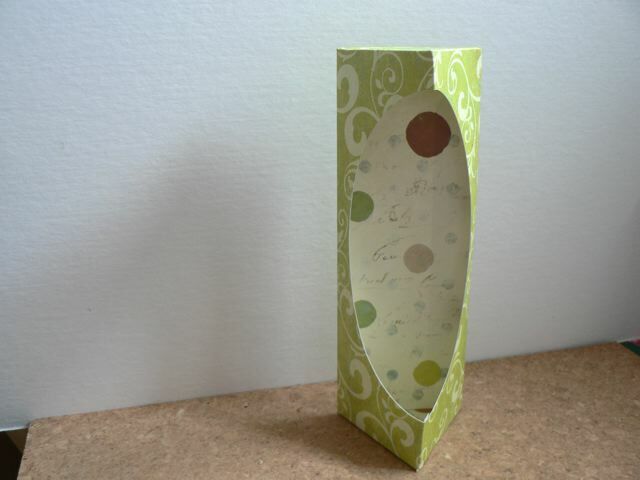 I covered the chipboard ovals. 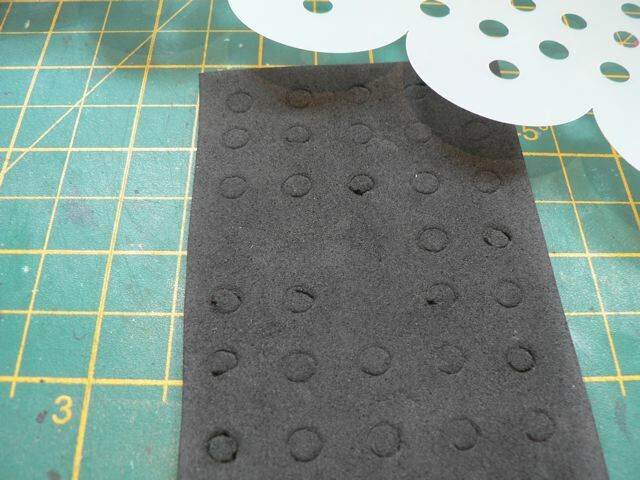 I added pop dots to the back of the word-strip and mounted it across the center of the chipboard ovals, wrapping the tails of the strips to the back and securing them with strong adhesive. Cute. But only five. Hummm. 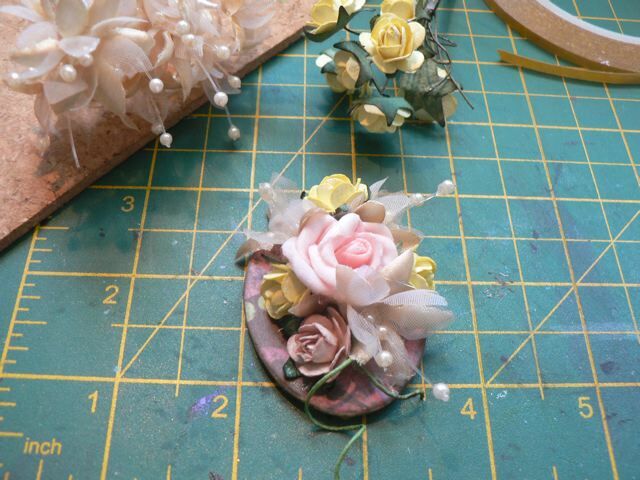 The last one has a little floral bouquet made from paper and silk flowers. Hot glue is best to assemble this. 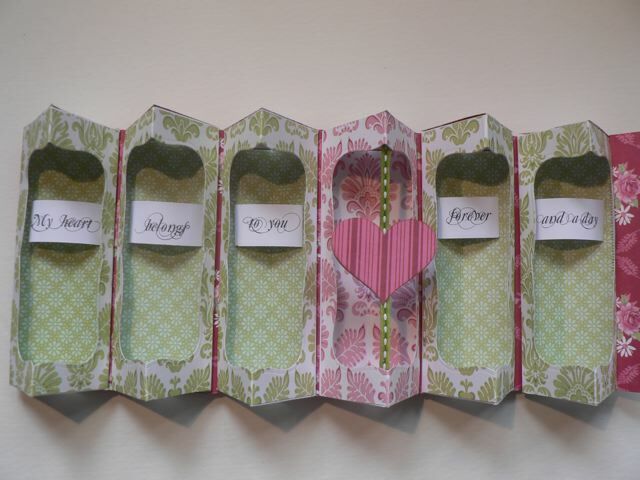 Decide on the running order of your boxes, if, like me, you have used different papers. Adhere an oval in the aperture of each box. Use strong adhesive, especially on the heavy one. OK, so while I was doing this I “lost” one of the boxes on my desk. How is that possible? you ask? Ha. Easy. And I found the 6th box! OK, now to put it all together. I don’t have photos for everything because some of it is just too hard to SHOW, but I can explain. The box is slightly taller than 6 inches. Bummer. 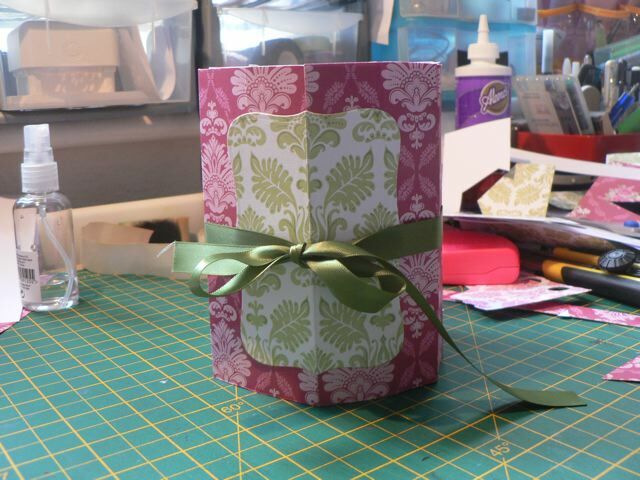 You need more than 12 inches to wrap around so you need more than a single sheet of cardstock – or do you? I’ve got a solution for that. 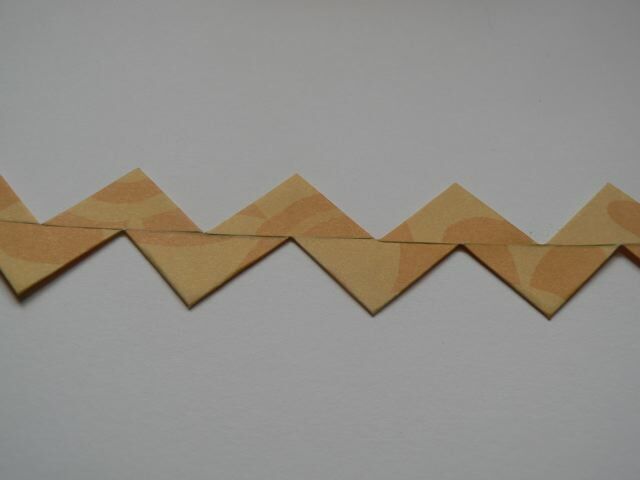 Depending on the accuracy of your folding and sticking you need two strips around 6 1/4 inches. Measure YOUR boxes and let that guide you. BUT, if you want to be frugal and use just one sheet of cardstock, cut it in half for two 6 x 12 pieces. 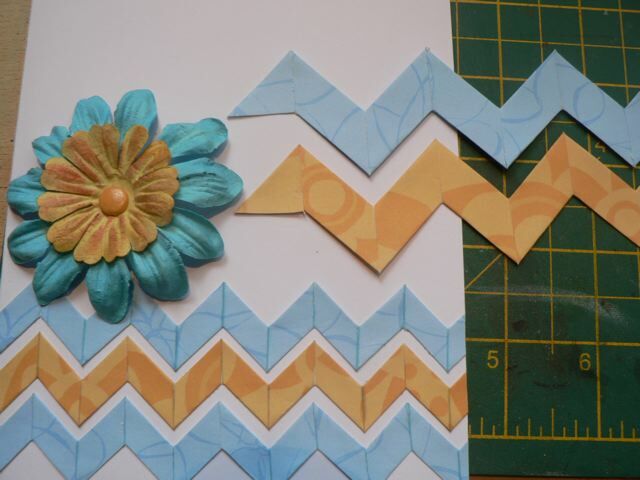 You can easily add a decorative strip using a border punch to make up the additional 1/4 inch. 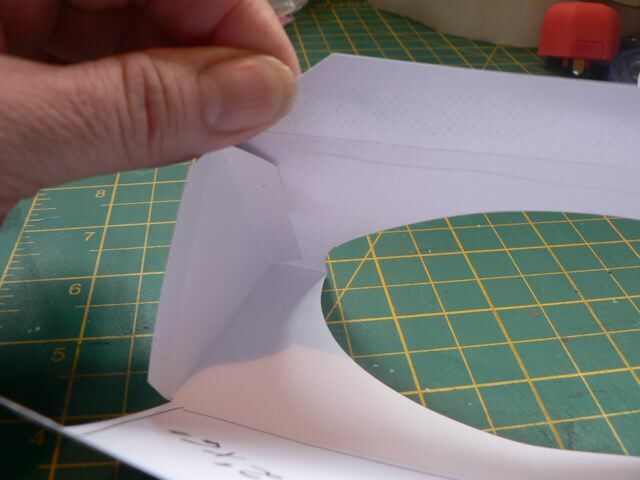 Stick this to the FRONT of the card, allowing what extra you need to extend past the edge. Score one end of your first 6(ish) by 12 strip at 1/2 inch from the left edge. Fold this over and secure it. 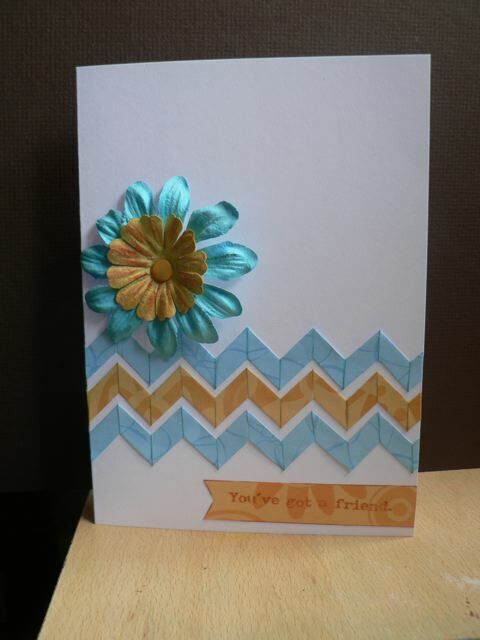 Add adhesive to the next bit of card, top to bottom but starting about 1/4 inch from the folded over edge. I know this is hard to see but the double-sided card was heavily patterned. Stick your box. Press well to adhere it, from within the aperture. It is critical that you try to ensure the edge is absolutely vertical, not badly askew. OK, Now forgive me when I say I am willing to bet that every box is not EXACTLY the same size. It may only be a variation of a millimeter or so but trust me you do NOT want to get to the end of this process and have it not close properly. 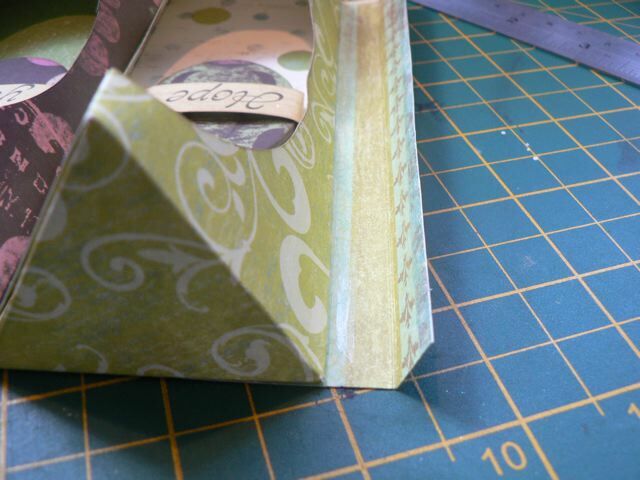 So rather than specifying a measurement for scoring the backing, I am going to say with your first box adhered to the backing, score just along the edge of the box. 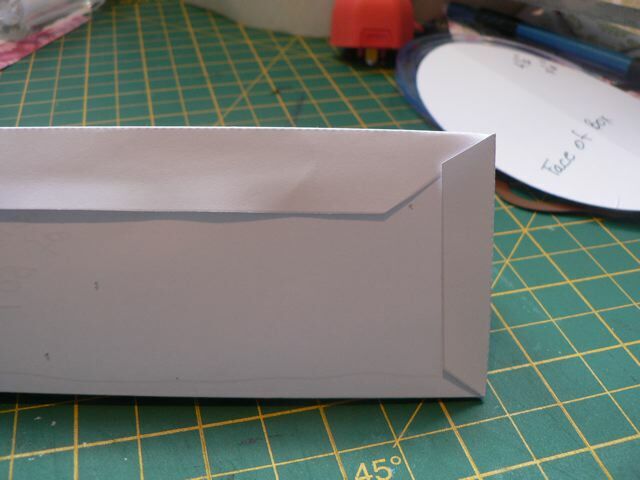 Fold up the tail to the right to crease. Now again, 1/4 inch away from the score line, add your adhesive You know how wide your box is (you measured it when I told you to, right? ) 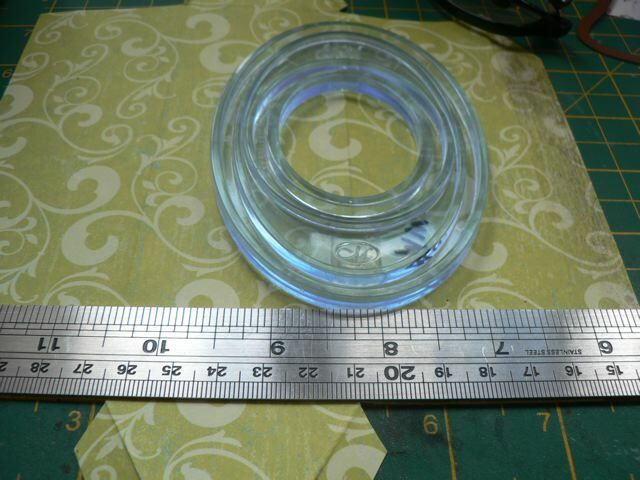 so add the adhesive, stopping short 1/4 inch of the full measurement. You have a little wiggle room here. You just don’t want the full back of the box to be adhered. 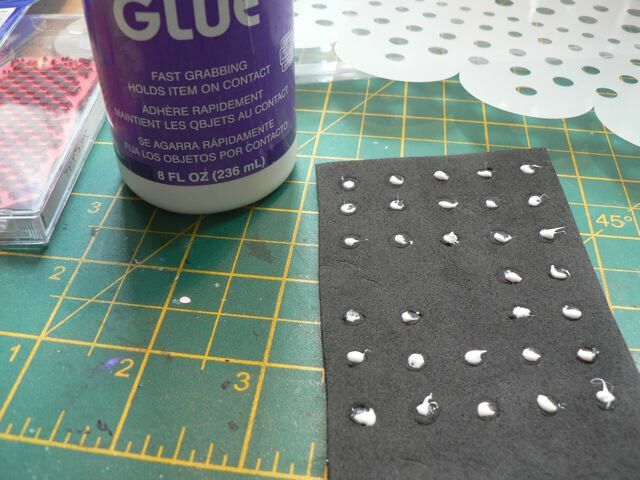 Carry on, scoring past each box as you add it, adding the adhesive but leaving your 1/4 inch clear on each side. When you are about to run out of your 6(ish) x 12 inch strip of card, add good strong adhesive to the outside and overlap the second piece of card to continue the strip. Fold your boxes in to check you are not getting off track. When you have added your last box, score 1/2 inch past the edge and cut at 1 inch. Fold this bit back on itself to finish off. Oops. That is actually the beginning, upside down, but it shows the same thing. Instead I grabbed a couple of clips and used them. Not ideal but they do make opening and closing the card really easy. 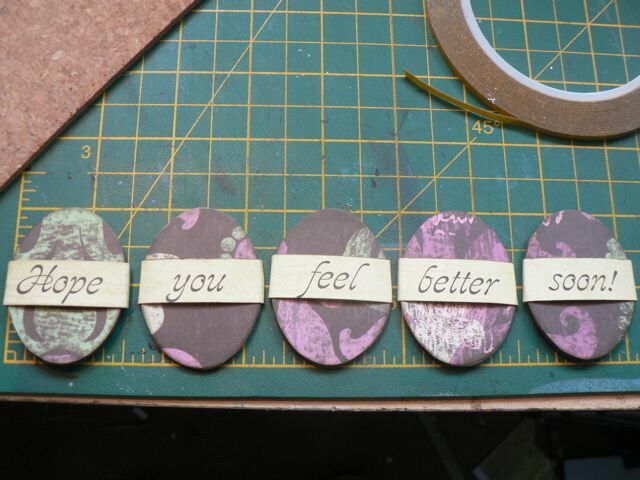 I just printed a greeting on some of the scraps and cut them in the same oval shape then stuck them to the front. You could add more flowers or something else but I wanted to get this done before DD arrived home on the bus. OK, so can you spot the fatal <tee hee> flaw in my paper choice? 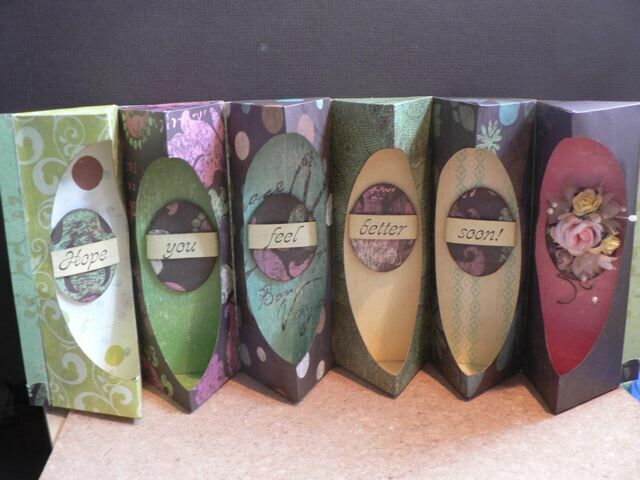 I was just about at the end of that paper pack, and while I did notice the blue paper says BON VOYAGE on it, it wasn’t till I had finished making all the boxes that I decided that the card would be a Get Well card. Ideally you don’t want to be saying BON VOYAGE to someone who’s not well, but by the time that sunk in I was too far along to swap it out. I may just have to add some other little scrap of paper over it. So there you go, and with minutes to spare! Phew. 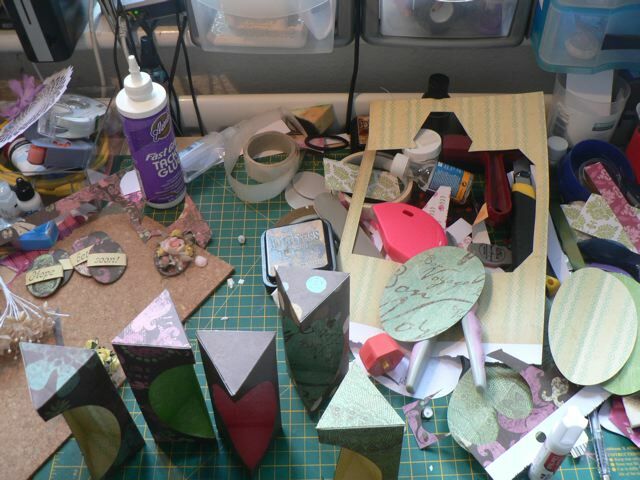 Categories: cards, paper sculptures, tutorial | Tags: cards, how-to, paper sculpture | Permalink. Again, my night-time brain was working. I liked the additional fold at the back because I liked how it looked from above, but in the interest of making the whole thing simpler I altered the template. In doing so I realized a few more improvements this brings to the process. I’ll explain as I go along. And with luck I’ll be able to add another completed project and more on the final assemble but need to address some house issues (guy coming round to assess some work needing doing.) But I wanted to get this much up for you. Firstly there is the template. I would love someone with the tools to create a cutable SVG file and send it to me to include. If you offer, I’ll accept! The template is a PDF and of two pages. The two templates do NOT mix and match! Use one or the other. One is for the original card, slightly smaller, with the additional fluted back. I won’t address that one here, but if you really fancy it, it’s there. 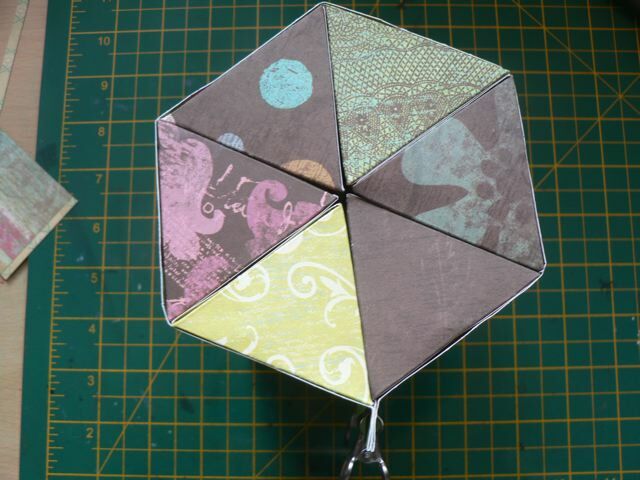 Trust me the simple triangle one is far easier and the difference between the finished projects are minimal. Where the original is useful is if you want to add something suspended in the middle – I will explain that is a future post with a project have in mind. But for now, let’s focus on the simple one. Print 6 copies of the template on cardstock and one on printer paper. 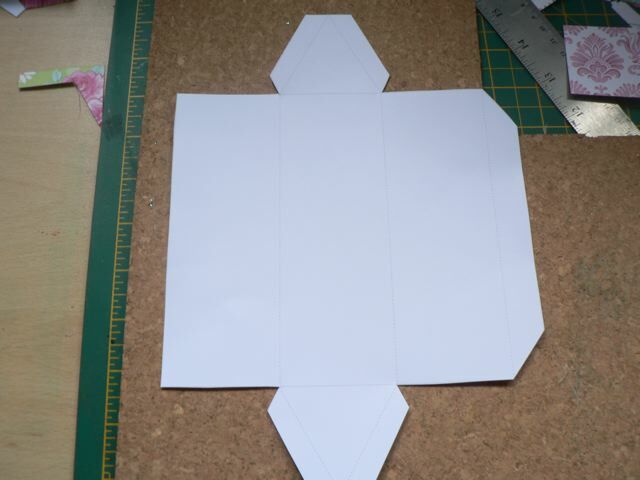 Not essential, but you can then get a template for the triangle. 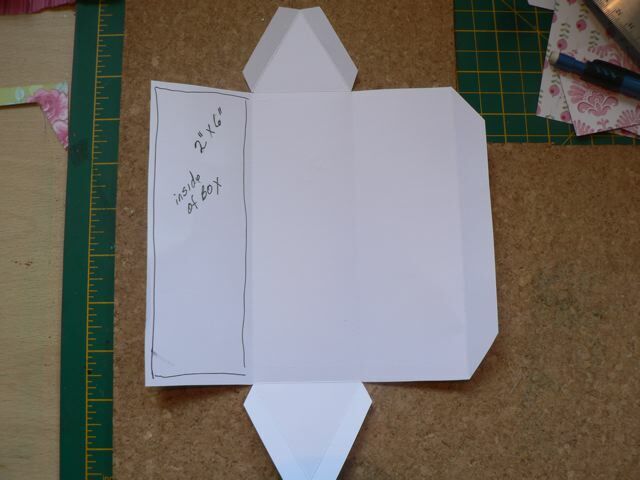 OR print one copy on decent weight card and use it to trace the lines on cardstock. I’ve made the lines VERY faint grey. I hope you can see them here but you should def. have no problem seeing them when printed. This means that you shouldn’t have to worry about the lines being very obvious on your final project, and both sides of the paper are visible in different areas. Now, score all dotted lines and cut on the solid lines. Crease the score lines crisply, towards the printed side of the paper. 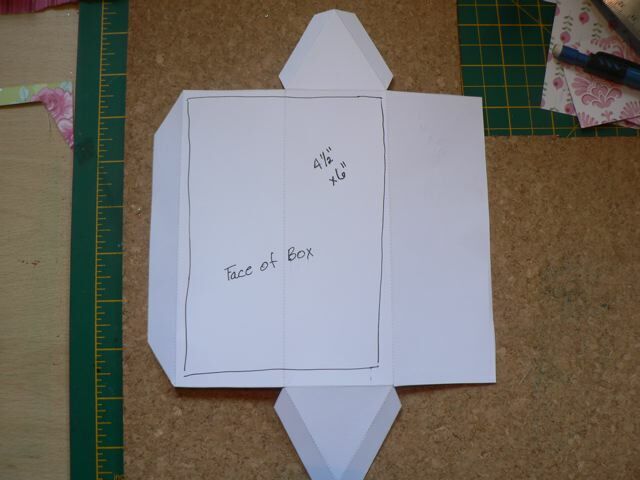 Looking at the back of the paper I’ve marked the area that is the face of the box. 4 1/2 x 6″ blocks of paper will cover it with a slight margin. 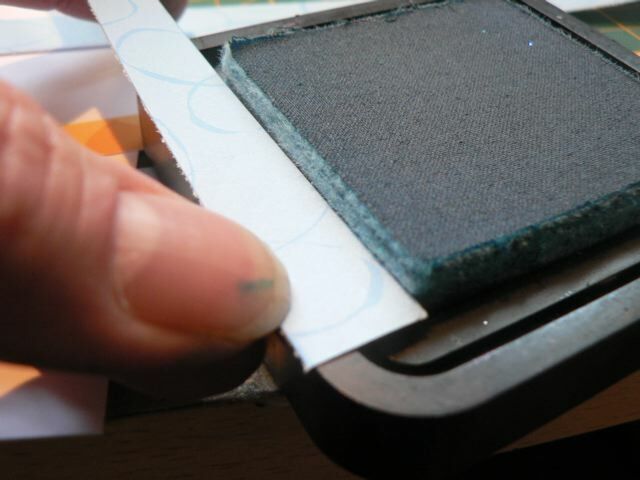 You want to cover the face of the card FIRST, before cutting the aperture. In the original I used a Nestie bracket shape to cut the aperture. This one will show an oval. 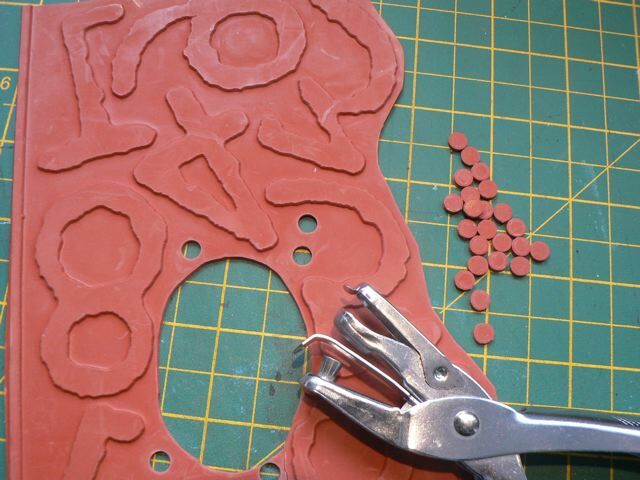 No oval Nesties round here so I’ll fall back on my trusty CM oval cutter. 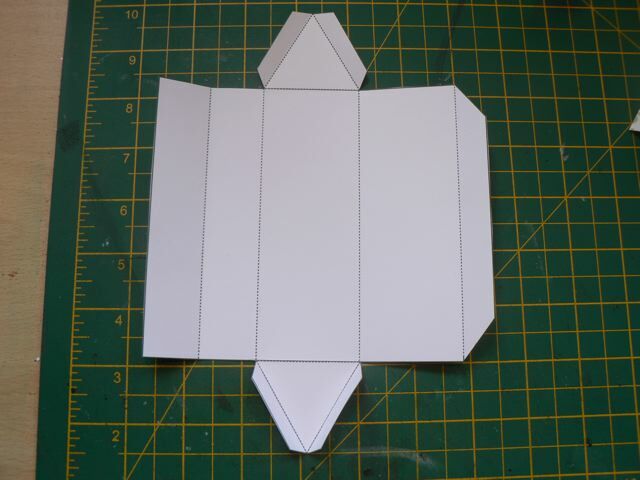 Do mark the position so all the cut outs are in exactly the same position, It will make a difference to the final finish. Looking at the back side, I’ve marked the area the will be seen inside the aperture. You can decorate the whole inside but you can also do just the back panel. Only a small area at each side will be truly visible so I’d say save your paper. First stick both the flaps without the a to the inside of the card. 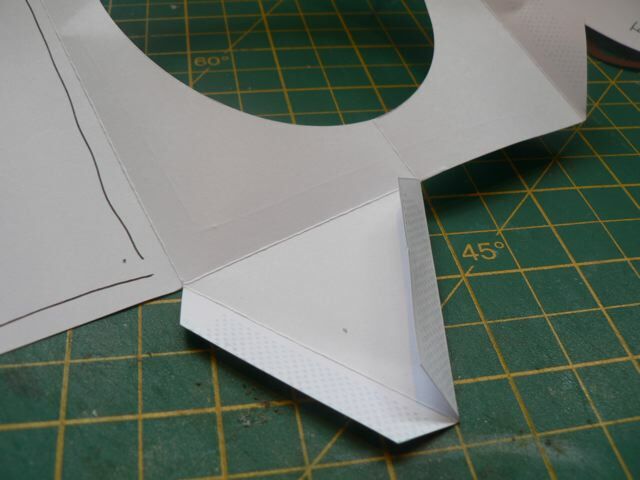 Next, stick the long flap to the outside of the card, forming a long pyramid. 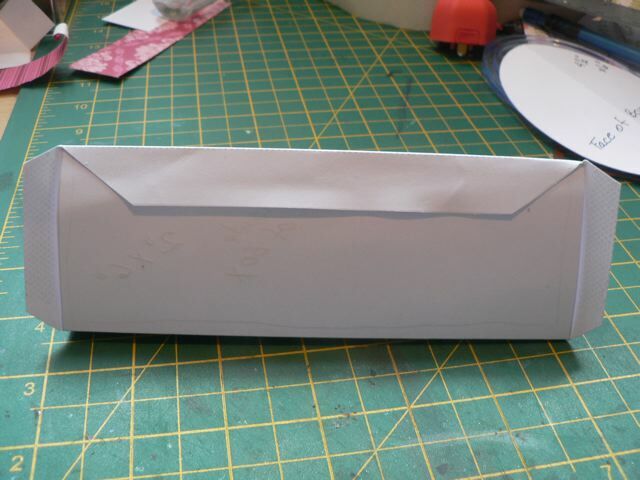 Finally, stick the flaps with the a to the outside of the card, closing the box. 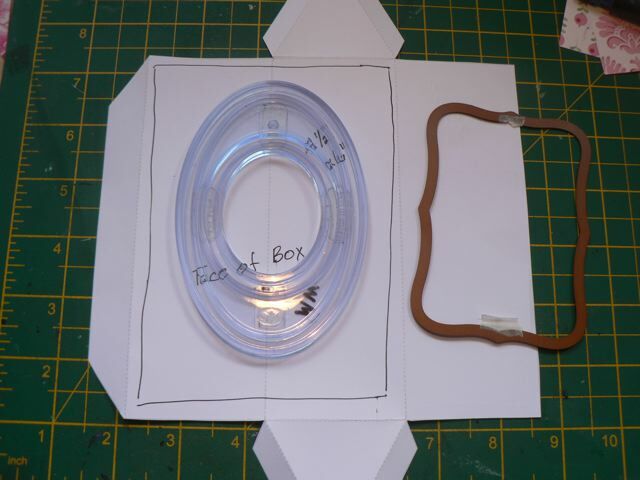 With the aperture cut out you can easily slip your fingers inside the box to press down the adhesive for a strong bond. 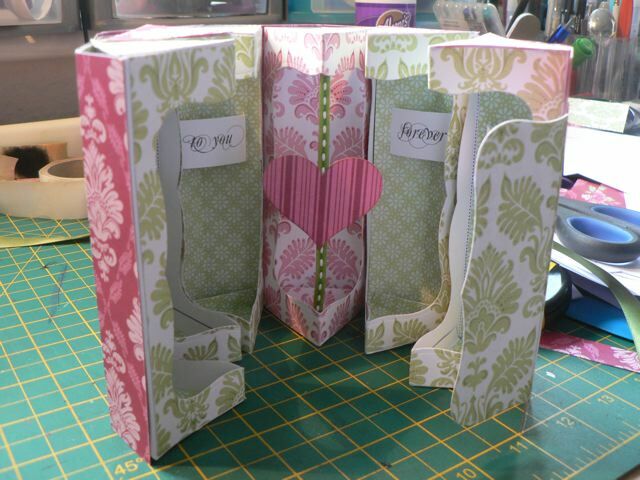 The back will be covered in the cardstock that holds all the boxes in place and rolls up to create the outside of the card. But more on that later! 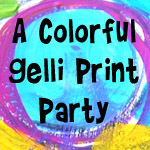 In fact you can print on double-sided cardstock so long as the printed-on side is a more muted pattern! That’s what I did here – and it will streamline the process even more. 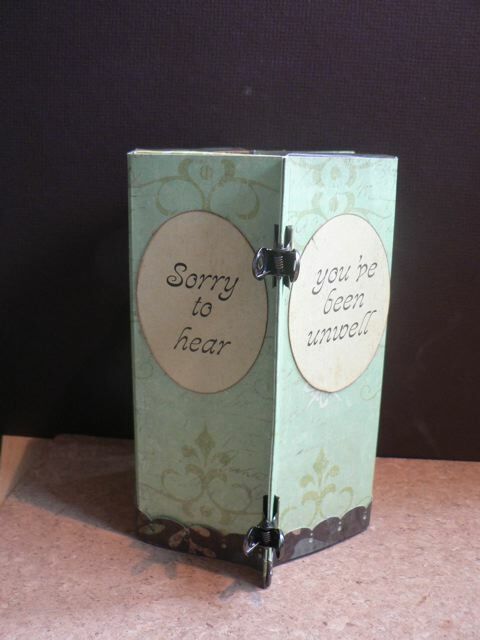 Due to the size you need at least A4/US letter size paper and can only get one from a 12×12 sheet of scrapbooking paper. The lines are faint but visible – and you can see the a here! Just a quick tip for placing your aperture – line up a strip of card or ruler if it is the right width, along the bottom of the card face. Position your aperture item against that. It saves you having to mark your card. and finally, a finished sample of the simple box, printed on cardstock. 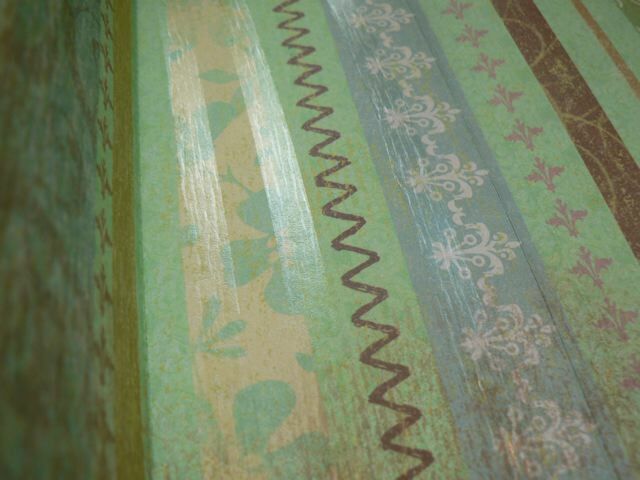 The printed lines are almost invisible inside the box – you certainly wouldn’t see them unless you were really looking. And all in all the simple version (page one of the template PDF) is pretty quick, printing on double-sided cardstock makes it even quicker and omits the faff of adding layers to decorate. There will be more to come on this cause you know me – I have to do things to death before I feel like I have exhausted the possibilities. Later today (or tomorrow) I’ll add the final assembly info, if you haven’t guessed how to do it already! 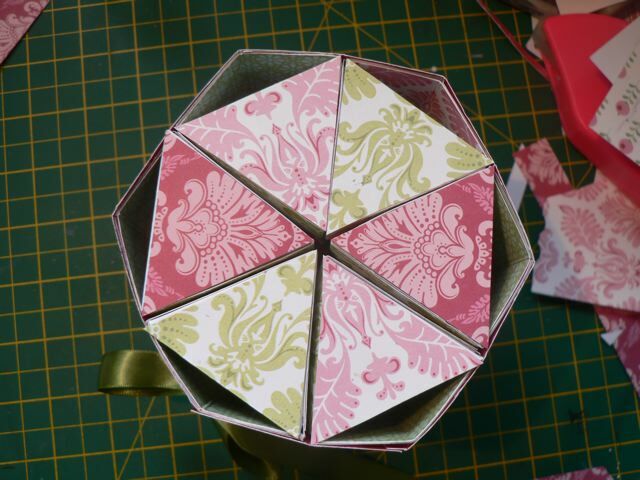 Categories: cards, digital goodies, downloads, tutorial, Uncategorized | Tags: cards, how-to, paper sculpture | Permalink. Did the title put you off or intrigue you? I had one of those ideas that you get sometimes and I wanted to figure it out. It took me AGES to create this template. It doesn’t look like much, does it? I’ll bet you are thinking Well, interesting, but what can I do with that?! Would you believe this? Shall we untie the ribbon? The funny thing is that although it takes some time to make (there is a lot of cutting and scoring and folding and sticking) it really isn’t as hard as all that. I’ll be sharing the template and the instructions, maybe tomorrow, maybe not (DS is headed back to Uni on Saturday and is hoping for a favourite meal for dinner and a suitcase full of clean clothes so it will depend on that) but to be honest many of you will see the template and know what to do. But it was fun to make and I have LOADS of ideas for other projects with the same basic idea. My desk is a disaster, as usual. I am working on a masterboard for a super-secret project. I’ll share one day soon. You can see it’s red, and some of the stuff I used and some bits cut out. Those two odd things on black? They are some stamps I made. 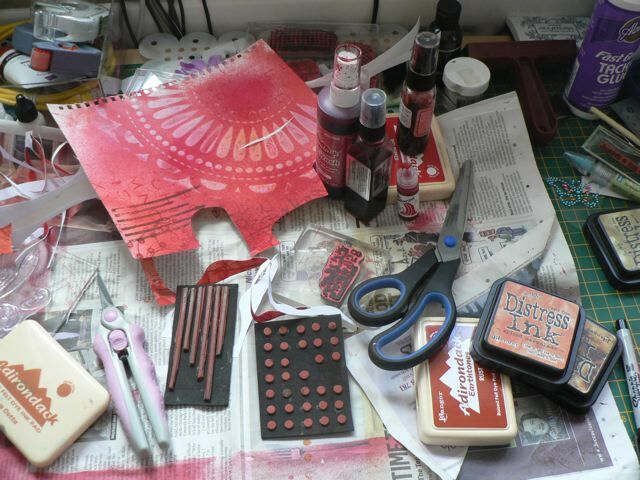 I wanted a dotty stamp that was different to the TH one I have but no patience to wait to order one and for it to arrive so I looked at my stash and thought How can I make what I need? Easy peasy, actually. 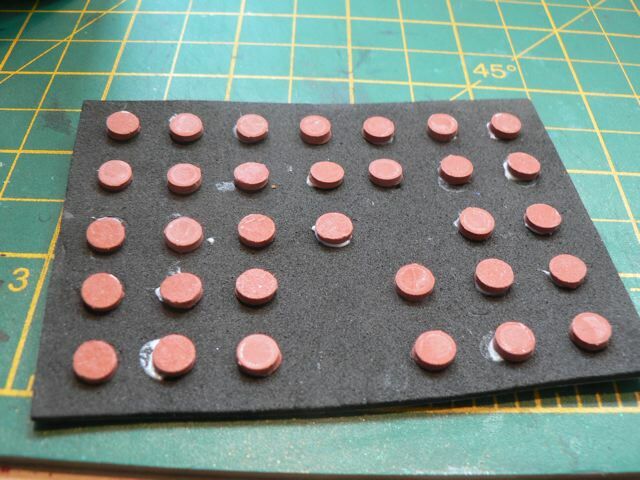 I used a holes template to mark the grid od circles, dotten on some glue and stuck the red rubber dots to it. And let it dry. It was sticky-backed fun foam so I stuck that to a bit of embossing folder packaging (nice big flat area) and I can then either use it flexible or stick it to a mount with repositionable adhesive. Worked a treat. The other one, the lines are from the edging of the stamp sheet, the raised surround. It’s not meant to be journaling lines, more a texture/design. You can see how it stamps in the red masterboard. I think I would do more of these, with different dotty patterns, as I need them. Simple, cheap, and immediate. Three of my favourite things! Now, I think I need to clean up a bit. What do you think? Categories: stamping, tutorial, WOYWW | Tags: how-to, stamps, WOYWW | Permalink. 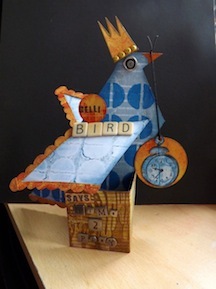 Yesterday I highlighted a layout by UKS member Daphnie on the HomePage. The whole time I was creating the BlogBits section it was preying on my mind. Where had I seen it before? As often happens, overnight my brain ruminated on it and by the time I woke up I knew. My folded corners! Although I have done it more recently as a YouTube video here (and that one is about decorative corners), you have to go right back to 2001 and my 2Peas gallery to see the original. I used vellum for the sample so you can clearly see the folds, I think, much better than you can with opaque paper. Oh dear, the state of my scanner at the time! Shocking. 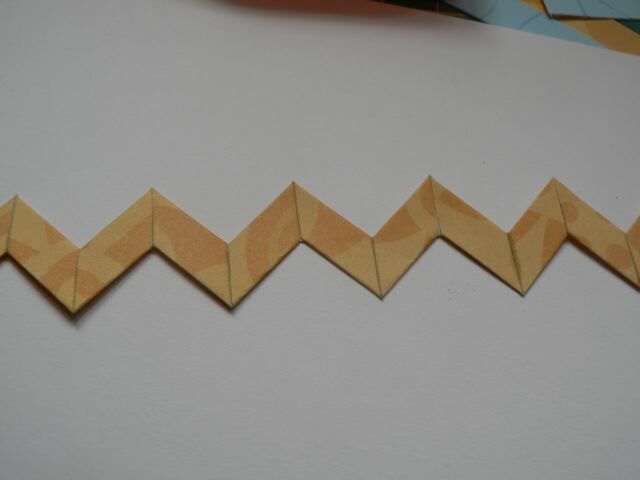 Anyway, it turns out the folded strip that forms the corners actually makes a chevron shape before you cut it apart! 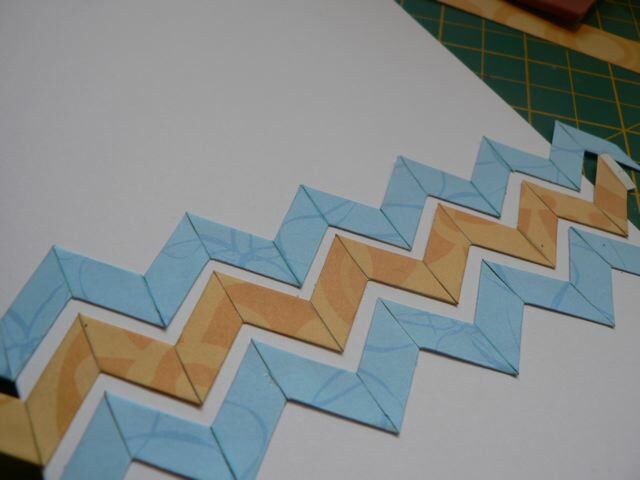 Now, the tutorial Daphnie linked to makes really nice chevrons, but there is a lot more involved to get the smooth face with no paper-edges on view. If you want that look, that is the way to go. But for what it’s worth, here’s my way. Firstly, you want to begin with paper weight paper, not cardstock. My feeling is it is just too thick. If you disagree, ignore me. 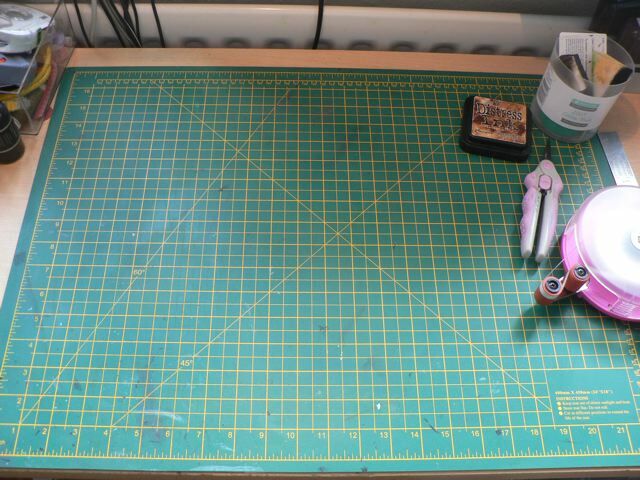 Cut as many strips from a 12×12 sheet as you like. I did three. Now, the width is up to you. 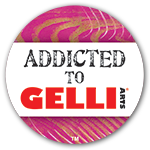 I show both 1/2 inch and 3/4 inch versions. I ink the raw paper edges. It keeps the white back from showing. But it’s not essential. One of my top tips is to use the edge of the ink pad to ink edges. Works fab for scallops, where you can slip the point of the corner into the scallops. But I am getting sidetracked. Run adhesive all along the back of the strip. This will secure your folds asyou make them. Watch the video or use the 2Peas info and fold your strip. When you get done folding, do NOT cut the strip. You can pick which side you prefer – I like what is really the back of the strip, as I think the vertical folds enhance the chevron effect. You may prefer the front, which is more of a zig zag. Now just stick them to the card front. 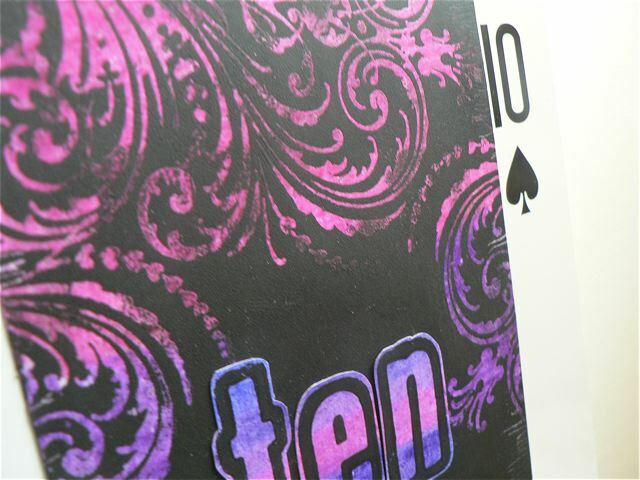 Be conscious of the folds and where they fall at the card edges. Trim off the excess and finish up with whatever decoration you like. This uses the 1/2 inch strip. 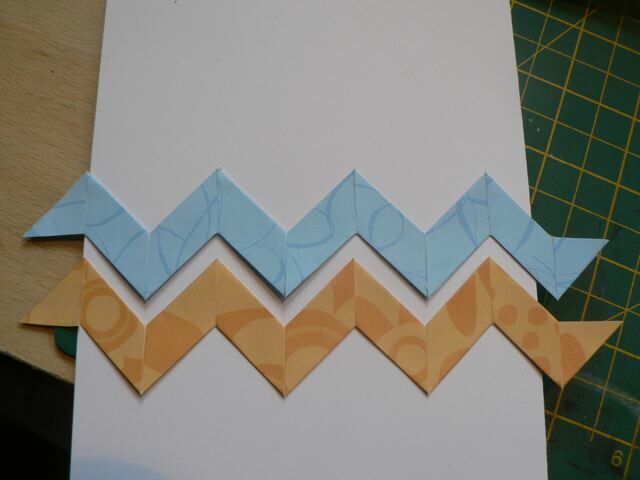 The 3/4 inch strip gives bigger (but fewer) chevron shapes. But they still fit across the 5×7 card, almost better as you can line up the first fold at one edge. Maybe this shows it more clearly. I do so love when what is old becomes all new again! 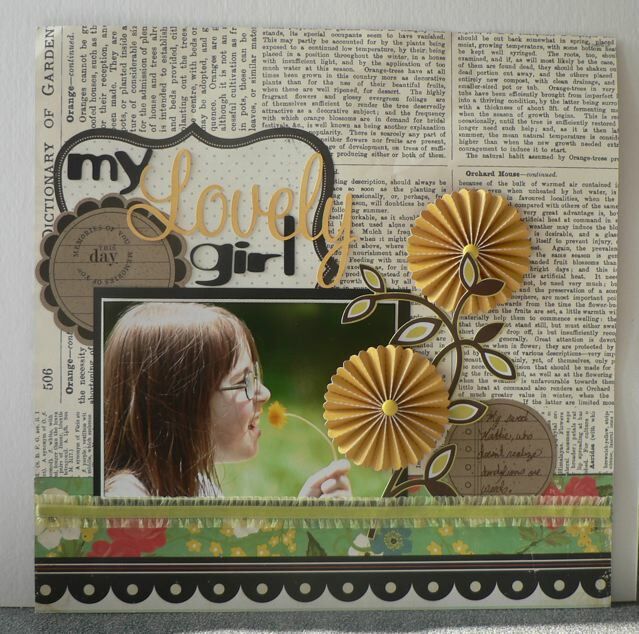 Categories: cards, New from Old, tutorial | Tags: cards, how-to | Permalink. A while back I did an article for SI using crayons. I’ve always meant to play further with them. Today I did. My first obstacle was not being able to find my black paint. With Easter just gone, I had the idea to make a sort of scratch card effect, a bit like the Ukrainian eggs you may have seen. 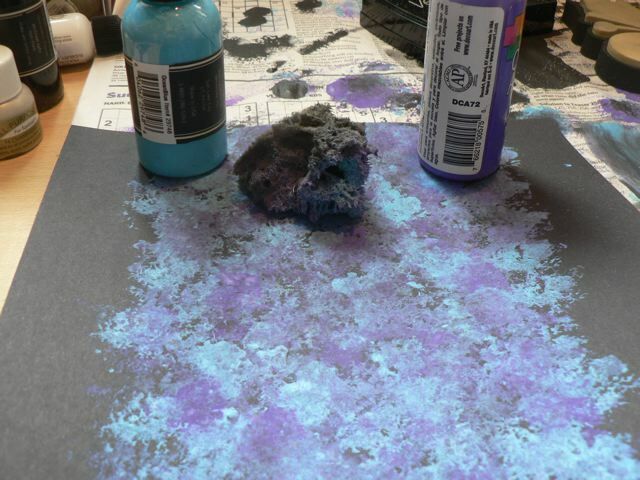 But I could NOT lay my hands on my black acrylic paint. I tried a few other effects (the most interesting was pouncing Versafine black ink over the crayon-coloured background then stamping with an un-inked stamp to lift off the ink. It was fine, maybe cool, but I just did not have the patience to let the ink fully dry and both a heat gun and an iron lifted off the ink from the waxy crayon) so I kept looking. I finally found an unopened (!) bottle of MM black paint. So here is what I did. 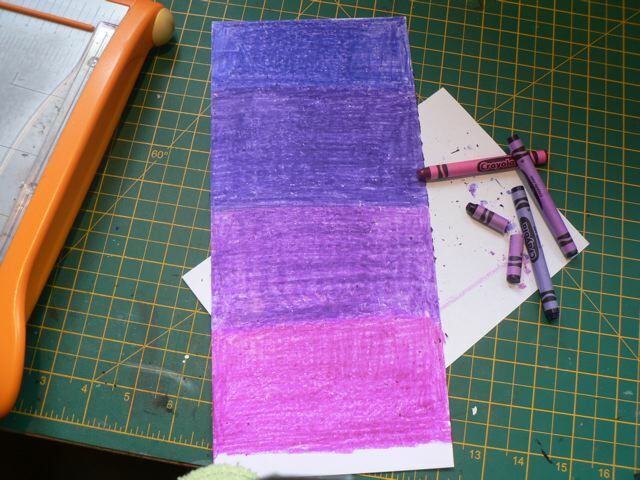 First I covered my white card with crayon – shade of purple. Just bog-standard Crayola. I aimed for a nice thick coat and didn’t worry too much about having thicker coverage in some places. I attempted the scratch-off effect, which totally worked – the idea was to paint over the crayon then stamp with black ink then scratch off along the lines to reveal the crayon colour. All well and good, but there is a reason my mail-room lunch time Hearts-playing mates at work called me “Mary Anne with the shaky Hand.” I think it was just the wrong sort of stamps. Anyway, then I had the idea to stamp with Versamark and emboss with clear embossing powder, over the crayon and see where that led me. I worried what the heat gun would do to the crayon, but it worked fine. 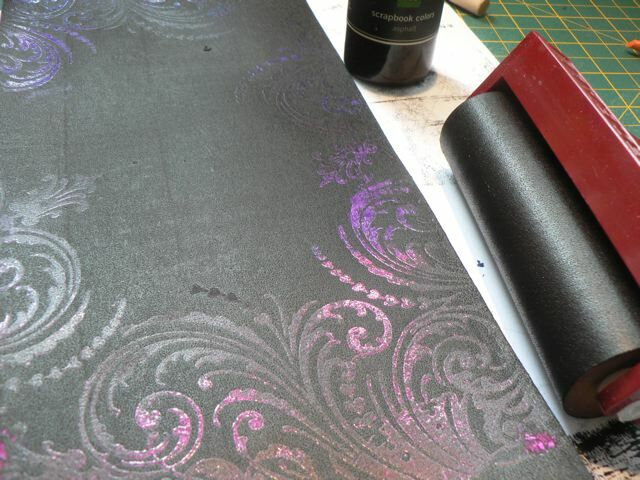 Then I carried on with the black paint, brayering it over the embossing. 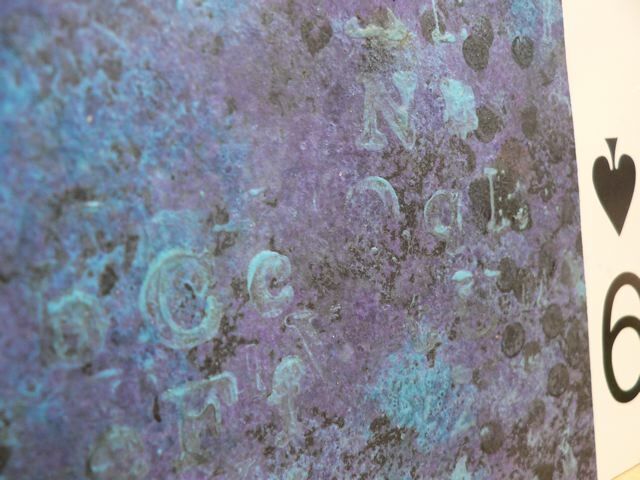 The brayer lifts a bit of the paint off the embossing, and if you want a super muted look, you could stop there. I carried on, using a not-to-damp baby wipe to whisk away more of the paint. Not scrubbing, a very light touch. To make the number-name I coloured a scrap and then rubbed over the crayon with a paper stump, to really smooth and slightly blend the colour. Ironing it between notebook pages works too. 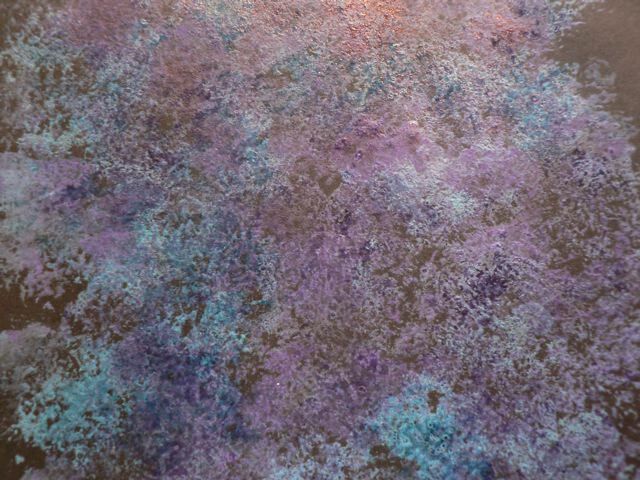 I like the interesting effect of the pigment spread. 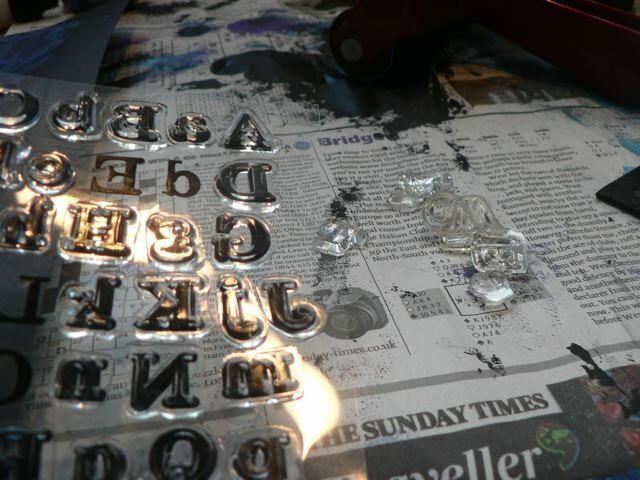 I stamped over this with black paint and cut out the letters then attached. I like the contrast between the matte paint and the shiny embossing, and the variation of the crayon strokes under the embossing. also the imperfect removal of the paint. I feared working with black as a background would give me trouble, but actually I am finding the whole process really interesting. I may ned to do an overview shot of all the cards again to see how I like them as a group and which ones I like best. To be fair, that actually changes week to week, so it might be pointless. Roll on NINE! How cute is that? This little wireless printer is due to be available in 2012. The maker, Berg, says this is the first of a few products that will be part of the Berg Cloud. If I grasp the concept correctly, you will use your phone to collect up information and then print it all one like a tiny digest each day. And it has a function to send a little message to another printer. I accept that this is clearly a novelty item, leaping BACK, away from a paperless existence, but it’s still charming. Having said that, it is a thermal printer, so much like old pre-natal scans (ok I am mixing my terms here – ante-natal scans or pre-natal sonograms for the UK->US terms) that ended up just a black smudge, it may not have long-term archival possibilities, but hey ho. Categories: Sunday someplace else | Tags: technology & scrapping | Permalink.